Well I got my new hot water heater this morning, and now I'm waiting for my dumpster to show up so I can put the old deck into it! That will feel good, and we'll have to comb through the house for stuff we've been wanting to get rid of. Of course the shutters will be gone, and our new big window will be one unit instead of 3 separate windows, with casement windows. It'll look completely different. We are keeping double hung windows for the bedrooms since the porch isn't very deep & we'd have to walk around casement windows. Hoping to finalize the order on that tomorrow, then there will be ~6 week wait. DH has dreamed up his deck plans. 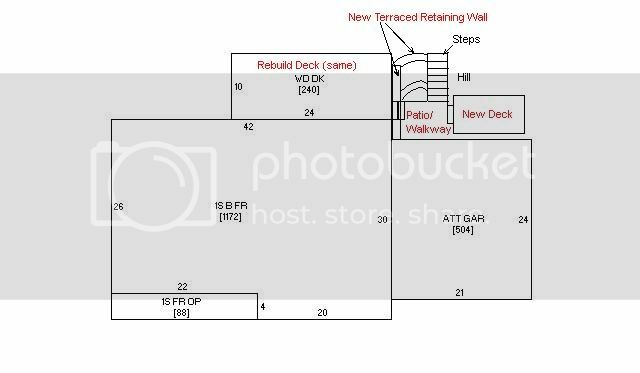 He will rebuild the deck we had with the same dimensions, add a 2nd smaller deck behind the garage, both which will step down to our concrete steps already in place. Between the decks will be some sort of walk/patio area. The retaining wall installer is going to terrace that side of the hill in two levels, that was his idea and I like it.